Inscription commemorating the opening and closing of the Holy Door by Pope Leo XII for the Jubilee of 1825. 1825 was a special year for the Catholic world. It was a Holy Year. There had not been a Holy Year for 50 years. 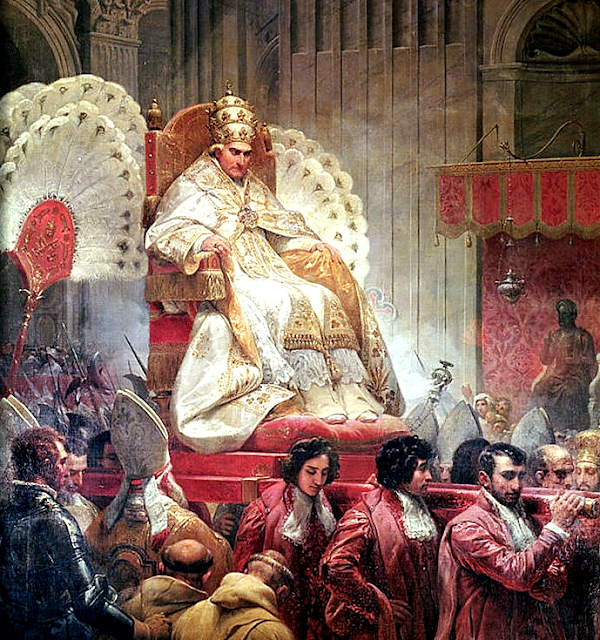 1800 was cancelled due to the fact that Napoleon prevented Pius VII from proclaiming the Jubilee of 1800. After 1825 there was not to be another Holy Year or Jubilee until 1875 and then it was a cleric only affair. "In the Roman Catholic tradition, a Holy Year, or Jubilee is a great religious event. It is a year of forgiveness of sins and also the punishment due to sin, it is a year of reconciliation between adversaries, of conversion and receiving the Sacrament of Reconciliation, and consequently of solidarity, hope, justice, commitment to serve God with joy and in peace with our brothers and sisters. A Jubilee year is above all the year of Christ, who brings life and grace to humanity"
" We Ourselves were witness in Our youth how helpful to salvation was the last Jubilee decreed in solemn form during the pontificate of Leo XII., at a time when Rome was the greatest and safest theatre for public acts of religion. We remember and We ever seem to see in Our mind's eye the crowds of pilgrims, the multitudes who in processional order went from church to church — the holiest in Christendom ; the apostolic men who preached in the public streets, the most sacred places in the city resounding with the praises of God, and the Pontiff' with his College of Cardinals setting an example of piety and charity before the eyes of all. From the memory of those times the mind is recalled with some bitterness to the sad reality of the present day." "11. Furthermore, you must see that those of your flock who have decided to make the pilgrimage may do so religiously, avoiding all the things on their journey which could disturb their pious determination and lead them to abandon their holy resolve. Rather may they follow eagerly and constantly those things which kindle and inspire religion. If you are free to come to this citadel of religion, you will add much splendour to this celebration. You will obtain the greatest blessings of divine mercies and, bringing them back as a rich reward, you will share them to the pleasure and profit of the rest of your people. Leo XII Quod Hoc Ineunte (Proclaiming a Universal Jubilee) May 24, 1824"
"During the universal jubilee, both the inhabitants of this city and the many pilgrims who have come here have shown faith, piety and every other virtue. We therefore conceived the great hope that the same zeal for the profit of their souls, for the glory of God, and for His Church might be kindled in the faithful everywhere"
Austria was cold to the Jubilee. The German states were down right hostile. But still the pilgrims came. For the French community in Rome, the year 1825 took on added, related significance. The coronation of Charles X at the cathedral of Rheims on May 29 was celebrated with grand festivities held on June 20 at the Villa Medici, the seat of the French Academy in Rome, which afforded the first opportunity in decades for the French to unabashedly flourish their national pride in a truly international context. Vernet`s patrons were Napoleon, then Charles X and then later again Louis-Philippe. He received the Légion d’honneur at aged 26. From 1828 until 1833 he was installed as Director of the French Academy at Rome in the Villa Médicis. In addition while in Rome he undertook for the King secret diplomatic missions to the Pope and to the Tsar. Accordingly his depiction of the Pope is likely to be extremely accurate. But Bonnefond`s work is more than propaganda. It reflects the French Romanticism of the age which was the reaction to the comprehensive defeat of 1815. It swept through the French culture of the time and suffused it entirely. One of its features was the increasing interest in history (especially medieval history) and religion. This was the time of Lamennais' attack on religious indifference (before he went off the rails). But behind the politics there was reality. It was this reality which outlasted the bubbles of French intellectualism and which was so fondly recalled by Pope Leo XIII almost seventy five years later. It is quite instructive in view of the recent criticism of Pope Francis and his decision to reside not in The Apostolic Palace but in the Vatican hotel and have his meals with the ordinary guests. Such a lifestyle as can be seen below is not from Vatican II but is from a far older tradition of the Papacy and can be seen as being practised by Pope Leo XII. "Some reader may perhaps ask in what, after all, consists the Jubilee, what are its duties, and what its occupations ? A Catholic easily understands it. It is a year in which the Holy See does all it can to make Rome spiritually attractive, and spiritually only. The theatres are closed, public amusements suspended; even private recreation pressed within the bounds of Lenten regulations. But all that can help the sinner to amendment, or assist the devout to feed his faith and nourish his piety, is freely and lavishly ministered. from sanctuary to sanctuary the successive trains of pilgrims ; the altars are crowded by fervent communicants ; while, above all, the spiritual remission of temporal punishment for sin, known familiarly to Catholics under the name of an Indulgence, is more copiously imparted, on conditions by no means over easy. But more serious still were the preparations necessary to lodge and feed the crowds of pilgrims who were expected. To prevent any alarm on this head, on the part of foreign princes, the Pope sent word to the embassies that he did not wish them to make any provision for their poor countrymen, as he took upon himself this duty of hospitality. He observed that he would rather pawn the church plate of Rome, than be wanting in its discharge. There is in Rome a large house, attached to a Church of the Holy Trinity, expressly established for the charitable entertainment of pilgrims. Hence it is called La Trinita dei pellegrini. It is divided into two sides, one for men and the other for women. The ground floor is laid out in immense refectories, above which are dormitories equally vast. During Holy Week there is a certain amount of activity in the house; as a considerable number of pilgrims then arrive, perhaps half a refectory, and as much dormitory, may be occupied. During the rest of the year, the establishment sends a huge carriage, now rather modernised, to the hospitals, to bring away all discharged patients ; to whom, under the title of convalescents, it gives three days' hospitality, and leisure often to look out for some occupation. The revenues of the house, the fruit of charity, are tolerably abundant ; so that it used to be said, that, in the interval between two jubilees, they were employed, the first half of the time in paying off the liabilities incurred, and the second in accumulating for the coming celebration. But, in addition to the accommodation permanently secured at home, the charity provided immense lodgings in the wide and airy corridors of religious houses. In the month of November, our confraternity of the Holy Trinity, to which many English belong, lodged and fed for three days, 23,090 men and 15,754 women, in all 38,844 persons besides 350 members of branch confraternities. From this some idea may be formed of the scale on which hospitality was exercised during the entire year. The order observed was the following. The pilgrim, on his arrival at the house, had his papers of pilgrimage examined, and received his ticket of hospitality. In the evening the newcomers were brought into a hall surrounded by raised seats, and supplied with an abundant flow of hot and cold water. Then, after a short prayer, the brothers of the confraternity, or the sisters in their part of the house, washed their feet wayworn and sore by days or weeks of travel ; and the ointments of the apothecary-, or the skill of the surgeon was at hand, to dress wounds and bandage sores. This was no mere ceremony, no symbolical rite ; but one saw and felt how in olden times " to wash the feet of the saints," when 'they asked for a night's harbour, was a real act of charity worthy of the Christian widow. It was evidently an exquisite relief to the jaded wayfarer. Thus refreshed, the pilgrims joined the long procession to supper. A bench along the wall, and a table before it, railed off to prevent the pressure of curious multitudes, were simple arrangements enough, but the endless length of these, occupied by men of every hue, and many languages, formed a striking spectacle. Before each guest was his plate, knife, fork, and spoon, bread, wine, and dessert. A door in each refectory communicated with a roomy hall, in which huge cauldrons smoked with a supply of savoury soup sufficient for an army. This was the post of honour ; a cardinal or nobleman, in the red coarse gown and badge of the brotherhood, with a white apron over it, armed with a ladle, dispensed the steaming fluid into plates held ready; and a string of brothers, at arm's length from one another all round the refectory, handed forward the plates with the alacrity of bricklayers' labourers, and soon furnished each hungry expectant with his reeking portion. Two additional rations were served out in the same manner. The guests fell to with hearty goodwill, and generally showed themselves right good trencher-men. Opposite each stood a serving man, who poured out his wine, cut his bread, changed his portions, and chatted and talked with him. Now these servitors were not hired, but all brethren of the confraternity ; sometimes a royal prince, generally some cardinals, always bishops, prelates, noblemen, priests, gentry, and artificers. Then, occasionally, a sudden commotion, a wavy movement through the crowd -would reach from the outer door, along the passage to the lavatory, just as prayers were beginning. All understood what it meant. The Holy Father was coming without notice. Indeed none was required ; he came simply to do what every one else was going to do, only he had the first place. He knelt before the first in the line of pilgrims, taking his chance of who it might be. If any priest were in the number, he was naturally placed first; and he would probably feel more sensitively than a dull uneducated peasant, the honour, not unmixed with humiliation, of having so lowly an office discharged, in his person, by the highest of men on earth. And then, he would find himself waited on at table, by that master who coming suddenly in the night upon his servants, and finding them watching, knows how to gird himself, and passing along, ministers to them. It was said that among the poor pilgrims came in disguise persons of high rank, who, after they had passed their triduum of charity among the poorest, faring as they, and receiving the cup of water as disciples in Christ's name, resumed their place in society, and remained in Rome as visitors, without any indelicate recognition. It was whispered that one couple, a German and his wife, were of even higher blood. Indeed, I remember one used often to remark, that the elegant language, the polished manners, and the half-easy, half-embarrassed air of some pilgrims, bespoke a different class from that of the general run. But one thing is very noticeable on all such occasions —the naturalness, and absence of embarrassment (so well expressed by the Italian word disinvoltura), with which these poor people received the attentions of persons whom they knew to be of such superior station, civil or ecclesiastical. While they allowed all menial service to be performed by them, without awkward bashfulness, or any attempts to prevent it, they accepted them with an humble thankfulness and a natural grace that showed how clearly they appreciated the motive which prompted their being rendered. They manifestly understood, that not merely to them, but to Him also whom the poor represent, were they offered. Supper ended, and its baskets of fragments for the morrow's breakfast put by, the long file proceeded up-stairs to bed, singing one of the short religious strains in which all Italians can join, a sort of simultaneous, yet successive, chorus winding along, stunning to your ears at the spot where you chanced to stand, alternately swelling and fading away, as it came from one or other side of the stairs, then dying away in the deep recesses of the dormitory above, yet seeming to be born again and grow at the beginning of the line, still unemerged from the supper-hall. During the day, the pilgrims were conducted in bands from sanctuary to sanctuary ; were instructed at stated times; were directed to the performance of their higher religious duties, by frequenting the Sacraments ; and at the close of the three days were dismissed in peace, and returned home, or remained in the city at their own charge. The Holy Father was the soul of all this work. 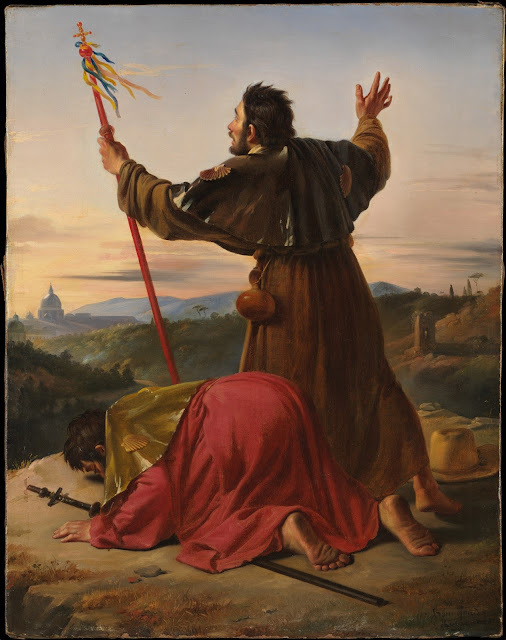 To see him, and carry back his blessing, was of course one of the most highly coveted privileges of a pilgrimage to Rome. Hence he had repeatedly to show himself to the crowds, and bless them. They were instructed to hold up whatever they wished to have blessed ; and certainly scarcely ever did Rome present a more motley crowd, arrayed in every variety of costume, from the sober, and almost clerical, dress of German peasants, to the rainbow hues of the Abruzzi or Campania. But the Pope manifested his hearty sympathy in his Jubilee by a more remarkable proof than these. He daily served in his own palace twelve pilgrims at table, and his biographer tells us that he continued this practice throughout his reign. To his accompanying them I well remember being an eye-witness. For one of such delicate health and feeble frame it was no slight undertaking to walk from the Vatican to the Chiesa Nuova ; but to perform this pilgrimage barefoot, with only sandals on his feet, was more than any one was prepared for. He was preceded by the poor, surrounded and followed by them. Tears flowed on every side, and blessings were uttered deep and warm. His look was calm and devout, and abstracted from all around. It reminded every one forcibly of St. Charles at Milan, humbling himself by a similar act of public devotion, to appease the Divine wrath manifested in the plague.